Whether you're starting a new business (or branch office of an existing business), or you need network support for your existing network, designing and implementing a new network is something we've been specializing in for years. It's great to see new businesses starting all the time - those are often some of the most exciting jobs as well, because we get to create something new. Getting started on the right foot with your network can lead to years of smooth sailing. There are many fundamental principles that are critical to ensuring a stable, scalable network infrastructure. If you're at that point and ready to get started, call us today! Unfortunately we've come across some customers who call us because things have never worked right and rather than wasting time trying to salvage it, they prefer to start over. Fortunately we have a lot of experience setting up networks and a fair amount of experience helping clients start over (fortunately this isn't something that has to be done very often). Proper planning can reduce the down-time associated with this and get you moving towards better times. Is it time to upgrade those Linksys routers to business class routers/security devices? Want to upgrade your servers to Windows 2008? 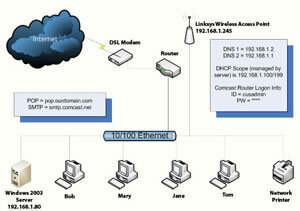 Want to add a wireless network? With some planning and a bit of testing, we can get these things implemented for you in a timely manner.